First-year Bachelor of Science in Nursing student Dawn Cardinal wants you to wash your hands. Especially after you play with Fido. 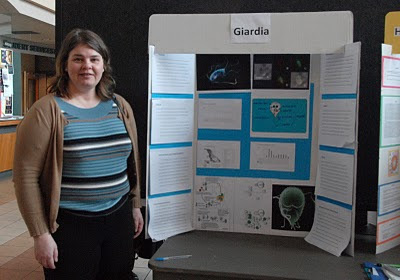 As part of her project for Student Research Days, Cardinal discovered that Giardia, a fatal parasite, is being passed from canines to humans. “People are petting their dogs, not washing their hands and then touching their faces,” she says. Giardia is the third most-common cause of parasitic death in the world. It’s most often found in contaminated water in wells or ponds. Cardinal examined Giardia in both its local and world-wide environments, and discovered that human-canine contact was most often to blame in cases of infection. She points out that luckily, it's almost always treatable. But the best way to prevent getting infected in the first place is to wash your hands. Cardinal hopes that her project will help raise public awareness about Giardia. With photos and contributions from Trista Orchard.